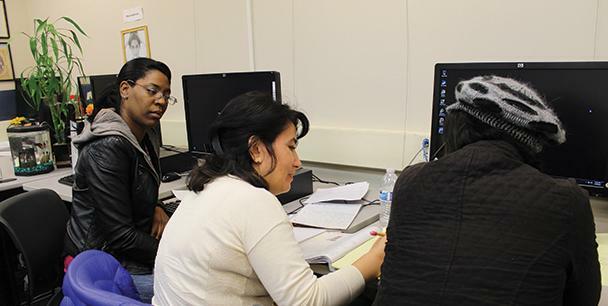 Suzette Brand(left), proctor in the DSP&S department looks on as Irina Li,(middle) Peer couch and also an ARC student volunteer, helping a student with her studies. A new program in the Disabled Student Programs and Services Department, or DSPS, is looking for students to volunteer to assist handicapped students with their school work. The Peer Coaching Development Program, located inside the DSPS building at the north entrance of the Student Services building, offers a place where students can feel comfortable asking questions pertaining to any course materials or academic careers. According to Houa Lee, one of the students instrumental in the development of the program, Peer Coaching is a fairly new program that offers student volunteers who are committed to helping American River College students in DSPS. The student volunteers are from different campuses who are studying to be counsellors or teachers and have a “heart” for the disabled student programs. Volunteers, referred to as peer coaches, assist students with any academic problems that may occur as a result of poor study habits or personal handicaps, and find ways to help the student overcome these obstacles by listening to students’ concerns and helping students develop stronger methods of approaching course material. Sophistry Ney, a proctor – a person who assists the blind, as well as people who find it difficult to write – in the program, is studying to be a career counsellor at Sacramento State University. “Peer coaching is a great way for ARC students to overcome their challenges in any subject matter they may need help in. The emphasis is peer student support,” Ney said. Callie Grady, an ARC Student and current volunteer in the program, joined due to her interest in helping disabled students. Grady has a disability of her own – a protein deficiency that causes narcolepsy, a sleeping disorder that causes excessive daytime sleepiness – however, she has learned to overcome this obstacle and as a result is able to help other students. The Peer Coaching Program is actively looking for volunteers. Suzette Brand, one of the proctors in DSPS and a member of the Peer Coaching program, explained how a student could become a volunteer for the program. “If you want to be a volunteer, you will have a brief interview to find what your strengths and then a short orientation,” Brand said. “We encourage any student that is successful in certain courses to volunteer their time to help other students and become an integral part of the team” continues Brand. Peer Coaching is offered to ARC’s DSPS students every Friday from 9 a.m. to 4 p.m. In order to ensure a student is able to get an appointment, it is suggested that students call a week in advance. Students are encouraged to contact the DSPS department if they need assistance with any subject. Be the first to comment on "Peer coaching assists disabled students"